Home News Exploring the religions of the mighty Kushans! Exploring the religions of the mighty Kushans! Coins are not just pieces of metals used in exchange for goods and services, they are wonderful and useful tools in the hands of archaeologist’s and the historians. They instantly provide information for trade, economy, mythology, rulers, military, important events, etc. Coins are a very authentic source to develop and record histories. One of the most prominent features of any coin design are the deities that are portrayed on them. They are an authentic source to study the religious and philosophical thought processes of the rulers and the area that they ruled. 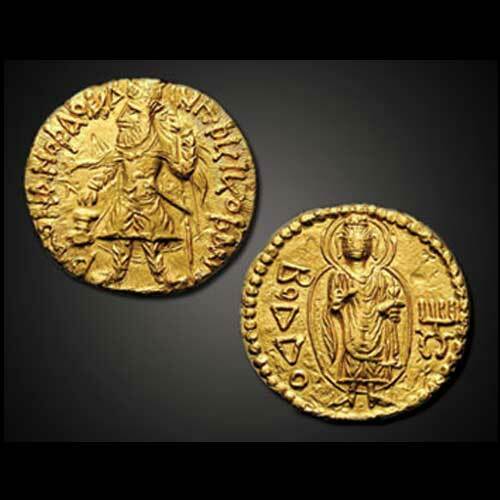 We are looking to study the religious processes in India, we cannot miss out on the wide plethora of multi-religious deities that were portrayed in the Kushanian coinage. The foundation of the Kushan Empire in Bactria and India was the result of a long series of ethnic migrations. It was also a period of great wealth, marked by extensive mercantile activities and a flourishing of urban life, Buddhist thought, and the visual arts. We have studied the Kushanian pantheon in detail. Read our blogs on the Dieties on Kushan Coins and give your valued feedback.